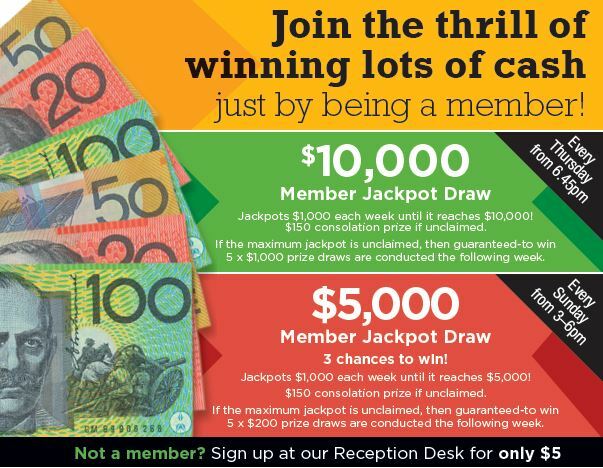 Win cash just for being a member! Starts at $1,000 and jackpots each week if not claimed, until it reached $10,000. One draw for this jackpot prize is conducted from our Membership base, if this person is not in Club there will be a $150 consolation prize. If the maximum jackpot is not claimed, then the following week there will be 5 x $1,000 guaranteed draws. Starts at $1,000 and jackpots each week if not claimed, until it reached $5,000. There will be 3 draws from our Membership base for the jackpot prize, if none are claimed then there will be a $150 consolation prize. If the maximum jackpot is not claimed the following week will be 5 x $200 guaranteed draws.